​At ​​Outlines, we're making our own brand of art materials which will impress and delight for any use from ​​creating professional ​artworks to ​painting designs for ​ crafts ​or community ​projects. With a wide​ array of beautiful colours, quality features and a huge collection of ​painting ideas, there’s no limit to what you can achieve with ​our first art product. ​​​​​​​​​​​See the latest Offer with the Paint Set ​In ​our Online Shop! ​We focus on Inspiring people who have never painted before and prompting established artists to join us in creative experiments with different techniques and materials, expanding their practises. We focus on Encouraging you to broaden your creative activities and inspiring beginners to experiment with new materials. Our set is designed to be substantial enough to fire you imagination. ​​​​Our followers make amazing artworks on multiple surfaces. They paint canvases, wooden toys, garden stones and even paint on clothes. 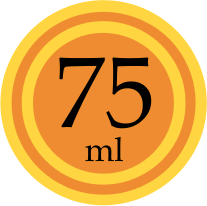 Many use our paints which are great for many Arts, Crafts and fine arts. ​It's important that our ideas can travel anywhere. We welcome visitors of every age and ability from all over the world and hope we can all learn from one another. Everyone's level of skill improves with practice. 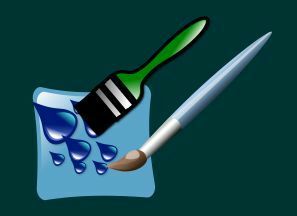 For Special Tutorials and tips on how you can use acrylic paints and other materials, why not Join Our Mailing List now! ​​*Newsletters ​may ​contain information on new products & the latest promotions. 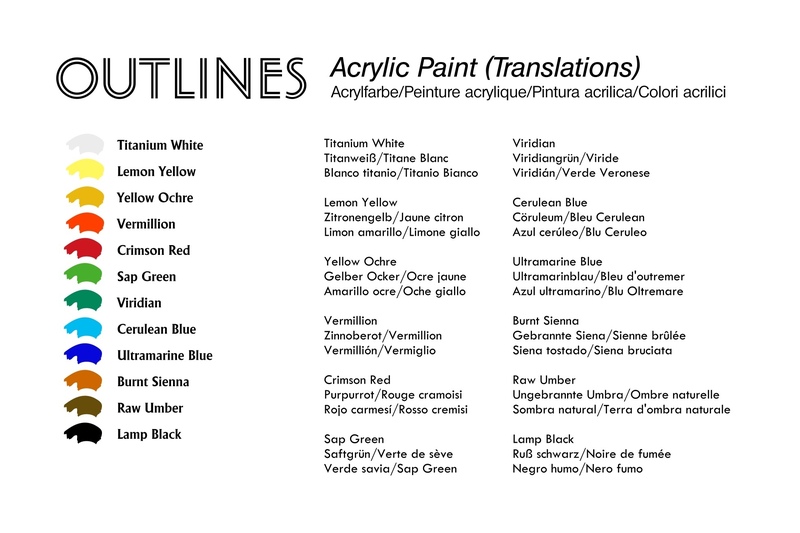 ​​​Start painting with our set of Outlines paints. Whether you know your way around acrylics or are a beginner, you'll find these paints mix well and work well on paper, canvas, wood and more. You'll have plenty of paint to experiment without running out. The rich vibrant colours in these generous Large tubes of Acrylic Paint give great results every time. 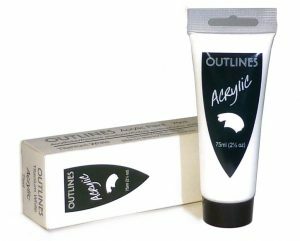 These acrylic paints are smooth and creamy. Acrylic paints normall dry fairly quickly, but these remain workable for good colour mixing and won't leave you frustrated when your almost done. They are thick enough to cover well but not too thick to blend effortlessly. The twelve colours are carefully chosen to give the broadest range of colours when mixed. ​Isn't it frustrating when the white runs out before all the other colours! Every painting needs tones of dark and light so you always need more white long before any other colour. You can buy a single tube of white too! The set includes black for the necesary punch when you need it, and the white gives you all the tonal range you will need.Always running out of white? You can buy a single tube of white too! 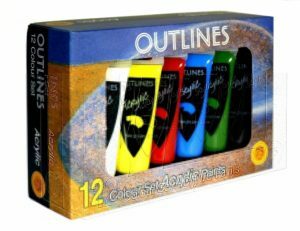 Outlines has been helping people to enjoy their pictures for over 30 years. We have framed pictures for art lovers, artists and photographers, exhibited paintings and prints in our gallery and even helped artists with their own websites. Venturing into producing our own brand of paint, specially formulated for use by established artists and beginners alike is truly inspiring. We would like to extend a huge 'Thank You' to all who helped in our research to get it right. ​We'll make sure ​members of our newsletter know about ​​​​special offers! ​​*Newsletters are occasional and ​may ​contain information on new products & the latest promotions. We respect your pri​vacy and you can unsubscribe at any time. Outlines has been helping people to enjoy their pictures for for over 30 years. We have framed pictures for art lovers, artists and photographers, exhibited paintings and prints in our gallery and even helped artists with their own websites. Venturing into producing our own brand of paint, specially formulated for use by established artists and beginners alike is truly inspiring. We would like to extend a huge 'Thank You' to all who helped in our research to get it right.